I made this salad for a few events that I held in our local community, the exciting thing thing for children is to prepare all the ingredients and to assemble together but the best thing is that children (and grownups) LOVE this dish as it’s full of flavour, freshness and colours. Nonna has always taught us to keep our dishes simple and fresh, this recipe is just perfect for everyone to be eaten in a hot day like today. In a serving dish mix together the cannellini beans, the diced pepper, the diced onion, the tuna, the olives, the basil, the salt, the olive olive oil and the balsamic vinegar. Beautiful and fresh for lunch and dinner, this is perfect for packed lunch too. Your family will love it! Boil 1 litre of water in a large saucepan. Add a table spoon of course salt and add the pasta in. Follow the cooking times on the package and add the broccoli florets 4 minutes before the pasta is cooked. While the pasta is cooking, use a pestle and mortar (or a hand blender will do the job too) and blend together the basil, parley, olive oil, salt, pine nuts and garlic. No nuts if you have a nut allergy. You can add a handful of parmesan cheese or a handful of fresh rocket. Drain the pasta and the broccoli. Mix together with the pesto and ENJOY!!! A fresh recipe perfect for the whole family. Put the flour into a large mixing bowl and add the salt. Gently mix with a fork. Pour half of the water into another mixing bowl and add the yeast. Thoroughly dissolve the yeast in the water until the water turns into a brownish colour. Pour some of the “brownish” water into the flour and with a fork or your fingers mix it all in. Continue to add water a little at a time ( you will have to add the other half of the water), combining well until you have picked up all the flour from the sides of the bowl. Add the olive oil. Once it is all combined, knead until you have a silky, smooth, elastic dough. Kneading: Push the dough out in one direction with the heel of your hand, then fold it back on itself. Turn the dough by 90 degrees and repeat. Kneading in this way stretches the gluten and makes the dough elastic. Do this for about 4 or 5 minutes until the dough is smooth and stretchy. Work quickly so that the mixture doesn’t stick to your hands – if it does get too sticky you can add a little flour to your hands. Now your dough needs to rest. Place it into a large bowl (you can use the same one you used for the flour), cover the bowl with a damp tea towel, this will avoid the dough once is proven to stick to the tea towel. Set it aside to prove (somewhere warm), this should take 1 hour and the dough should double in size. Now your dough is ready! Preheat the oven to 220C/fan 200 degrees. Halve 150g of plum tomatoes and take out the seeds with a little spoon. Mix the tomatoes with a good pinch of salt, a table spoon of olive oil and a table spoon of dried oregano. Tip out the dough on a lightly floured work surface and roll out into a round shape (or a square, depending on the shape of your baking tray). You may have to stretch it with your hands a little. Put it inside a non stick tray (alternatively you can use a baking sheet). Push the tomatoes inside the dough leaving a little gap between each other, sprinkle a little more salt and pour 4/5 tablespoons of olive oil all aver your bread. Bake for 15/20 minutes, until the bread in golden! Comfort food perfect for the whole family. This what I call Comfort Food Italian Style, whether it’s cold or hot outside it will warm your family up or it’s delicious eaten cold too. Add the salt and stir the vegetables. Add the curly kale, the stock and cook with a lid on for 15 minutes. Hello my friend, I am going to take you to my little island…. The day I asked my friend Anita to come with me to Sardinia for a short visit I did not realise that that trip would have meant so much for both of us. For me it meant that my beautiful country with its food, its history, its traditions and its way of living would have been such a source of inspiration. For my friend it meant that the way of eating and enjoying food would have changed for good for her and her family. The first word that sprung to my mind as we drove up the winding road through the green mountains and along the coastline of turquoise waters: PARADISE!! The beautiful blue sky and temperature of 26 degrees at the end of the summer, 2 and a half hours flight from home, I instantly felt relaxed. Sitting with Lara and her Mum Gina in the garden, drinking -Yes you’ve guessed it, coffee, very traditional when passing time with friends and family, they would pop by and have a good chat and a strong cup of coffee. Surrounded by olive trees, cactus plants and fresh herbs, I was excited to experience the real Sardinia. What better way than to stay with my friend Lara and her Mum at their B&B Le Colline di Morimenta and live and eat as they do. Whilst we relaxed Gina busied herself in the kitchen preparing lunch -here she is the Queen and the Boss of her kitchen. Sat around the table together we enjoyed goat stew, pasta in sauce and fried aubergines in breadcrumbs. I could instantly taste the freshness and the quality of the food. We were also joined by Lara’s friend Thomas and his two children from Germany, who also have a passion for fresh healthy food and he has come to experience the Mediterranean diet and get some great ideas to share. Later we dropped in on neighbours who welcomed us all into their home offering coffee, cakes, lots of conversations and laughter. For our evening meal we all joined in preparing a lovely banquet of fresh prawns, aubergines, salad, pasta and lots of water and a few glasses of local wine. Even though I felt I’d eaten so much it was all very healthy and no need to snack in between meals. I am starting to realise why they have such a healthy diet and the highest level of centenarians. 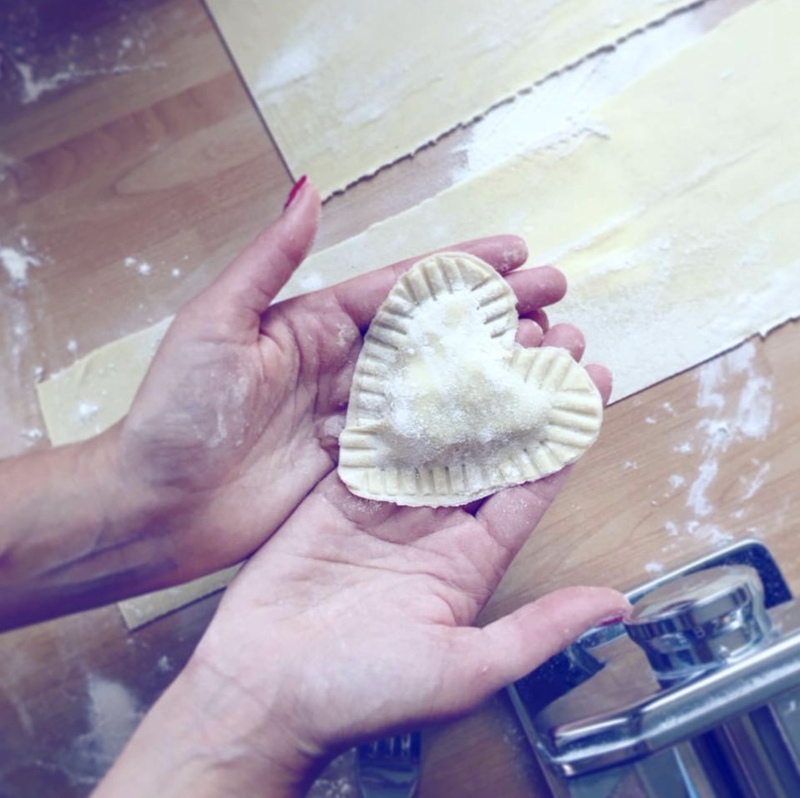 Today we all came together in the kitchen to make ravioli, one of their favourite dishes. It was absolutely delicious, all freshly made and another opportunity to chat and laugh together. After lunch we headed to the beach. As I walked around the corner I was greeted by pure white sand and crystal clear aqua sea. It was absolutely stunning! Families would often go down to the beach and bring lunch, fresh fruit, pasta dishes and plenty of water. After breakfast I joined Lara and Gina on their trip to the local supermarket for ingredients for today’s lunch and dinner. Straight away I noticed the amount of fresh fruit and vegetables, all the colours and the quality was amazing, the meat and fish were so varied and so much choice. There seemed to be so many aisles of fresh produce and one aisle of treats. If only our supermarkets were like this I think there would not be so many people eating the wrong foods. Lunch was pork steak and salad. I got to sample some ‘mortadella’ and gorgonzola which Lara says is her favourite food when she comes home. I tried fennel for the first time also, sliced and drizzled with a little olive oil, squeeze of lemon and pinch of salt. I didn’t know fennel was so good for your digestive system. I’ve always walked past this vegetable not really knowing what to do with it. You can also add to soups and stews. Mediterranean food, lots of water, sun, family around the table taking time to talk to each other is such a good life recipe we should all be able to enjoy! My time here is Sardinia is something I have thoroughly enjoyed and have gained some knowledge of how to cook fresh healthy dishes that are simple to prepare. Taking time to sit at the dinner table and talk to each about the days events without gadgets taking centerstage. I hope to bring some of my experience to my family, unfortunately I cannot bring home the sun but if I can feed my family some heathy wholesome food with a touch of Italy they would feel the sun shining through. It’s my first cooking video and I wanted to share it with you. I am cooking for my friends and I am Bringing Nonna to their home sharing with them all her precious advice. Place the butter on a no-stick pan, the olive oil and melt in on a low heat, add the onion and simmer until golden. Add the rice and stir it. The rice will start roasting and it’s important that it doesn’t burn. Have your stock ready and make sure it’s hot, alternatively melt the gelatine cube in the hot water and mix it thoroughly. Gradually add the stock in the pan and keep stirring the rice, repeat this until you have used all the stock. Add the asparagus Sprinkle the saffron and mix it throughly. Cook for another 2 minutes. The rice will look creamy and will taste “al dente” . Serve it with some fresh parmesan, shavings or grated. Pronto! Ahhhhh you are going to love this recipe! It’s quick, easy, wholesome and full of the Mediterranean goodness that both my Mum and my Nonna always rave about, I can hear them say ” We are not on a diet, we eat a variety of foods and we make sure we use all the foods that are good for you: fruit, vegetables, fish, fats, proteins…… “. My Nonna is 96 years old, her sisters are all between 80 and 85 years old, my Mamma is 70 years old, my great aunt is 98 years old and I even had a great uncle who lived till he was 104. I can see now what they have been telling me all my life, it is definitely not a diet, it is a way of life that I am lucky enough to have experienced and I am going to treasure forever. Thanks to what they taught me I am now teaching my children to enjoy food just like I did as a child, but not just my children need to know what type of food is good for their heart, what food prevent diabetes, obesity, dementia and other serious conditions. So this recipe has got a little bit of everything, a subtle combination of white wine vinegar and tomatoes, garlic and bayleaf and a little bit of wine ( POCO VINO) …. all those flavours are going to make any fish dish extremely tasty. Put the oil, garlic and bayleaf in a large pan. Simmer and add the fish. Season the fish with salt. Cook on a medium heat for 3/4 minutes. Pour the wine in and let it blend in with the fish, add the passata and gently mix with a spoon. Pour in the white wine vinegar and cook on a low heat for another 10 minutes. Add the tomatoes and cook until they soften up. Sprinkle some fresh basil and season with more salt if needed. Pronto! !